The aim of this post is to put forward proposals to improve equality in academic appointments and promotions. The primary intention is to improve prospects for women academics, although these proposals would also benefit both women and men who have taken career breaks, work part time or who have worked in industry or other sectors. I propose two ideas that are detailed below: first, a move away from ‘career total’ publication metrics in favour of ‘personal best’ metrics; second, a commitment to gender balanced panels. I am putting these proposals for discussion within the school/university in which I work. However, the problems (and solutions) are really quite general – certainly in the UK and probably internationally. Thus I am putting these ideas into the public domain because I would like to see them discussed and implemented across all institutions. I have also taken a ‘life science’ focus because that is the domain in which I work; I am sure that there are similar challenges in other fields. 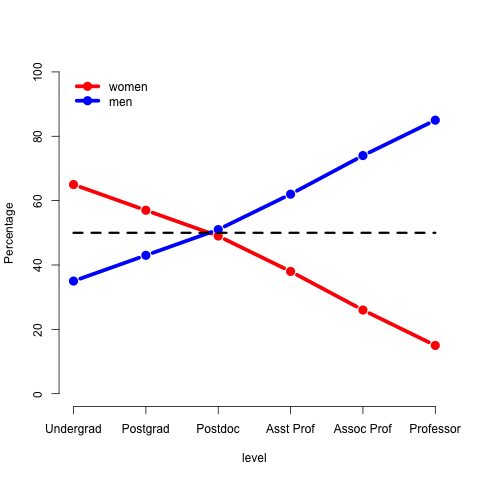 The graph shows a ‘typical approximate proportion’ of women and men at undergraduate, postgraduate, postdoctoral, assistant professor (lecturer), associate professor (senior lecturer / reader) and professorial level in a ‘typical’ Life Sciences department: these data are based on some real data but have been modified to give a straighter line and to preserve anonymity of the data sources. While the majority of students are female, the majority of staff are male, and the proportion of women decreases at every stage of career development. There are many complex reasons for this; nonetheless, this situation is a disgrace, not to mention a tremendous waste of talent. It is incumbent upon us to take action to remedy this. There are likely to be very many actions that could help. Here are two I propose: they are certainly not exhaustive. My first proposed change is to stop using ‘career total’ publication metrics for appointments, promotions and academic biographies and move instead to ‘personal best’ metrics. Career total publication metrics include total number of papers authored, total citations, h-index and other such measures. For example, a university might have guidelines for the number of publications needed for a professorial appointment. These metrics discriminate against people who have had career breaks (especially women), worked in other (relevant) sectors (industry or public bodies) or who work part time (e.g. 80%; also often women). The judgement is made on a suitable period prior to the appointment/promotion. For example, 6 years, as per the REF, seems very sensible. The applicants’ top 4 research outputs in this period are considered. These need to be outputs where the applicant is a leading author (i.e. first, last or corresponding author – note that this is tougher than a REF submission). The outputs also need to be ‘new’, i.e. not used for a previous appointment or promotion within the organization. Where somebody has worked part time, or has career breaks during the period, the number of outputs are reduced pro rata. The panel assigns star ratings to each of the outputs on a similar scale to the REF (i.e. 0-4, possibly with the option of using fractional values e.g. 2.5). For appointments, candidates can then be compared on the basis of their best outputs, with appropriate pro rata adjustments. This is a much fairer system than using career totals. For promotions, a set star rating is agreed which is then uniformly applied, with appropriate pro rata for part time staff. For example, for 11 starts for Associate Professor, 13 stars for full Professor etc. These criteria would completely replace career total judgments. Other criteria (on teaching, contributions to the university, international reputation etc.) would of course remain in place. This would be a fairer, more transparent system because universities would be recruiting and promoting people on the basis of their best research. And this system would also be aligned with REF, which would itself have benefits. Moreover, I would suggest that we use these criteria when describing biographies of senior academics. We would not say “Professor X has published over 150 papers…” Instead, we would say “Professor X’s most important work has been Y, and most important recent work has been Z”. Thus we could also eliminate ‘career total’ as a mark of esteem and instead use a ‘personal best’ esteem narrative. Panels of size 3-5 must contain at least 1 woman (and at least 1 man). Panels of size 5-8 must contain at least 2 women (and at least 2 men). Panels of size 9-11 must contain at least 3 women (and at least 3 men). These compositions would help to reduce unintended bias and, in my view, improve prospects for career progression for excellent women scientists. Wow! I shall be showing this to everyone who will be leaving the lab in future. We wish Michelle well and would welcome her back in any role when she returns to work.